So please, do be careful, do not go out about the town lest you run into one of these ladies; else you too will be made an offer by the “Godmothers of Giving.” These ladies will teach you the meaning of “fun” in fund raising. The Bees have several fund raisers throughout the year, so please bookmark the BusyBees events page for future “fun” raisers. 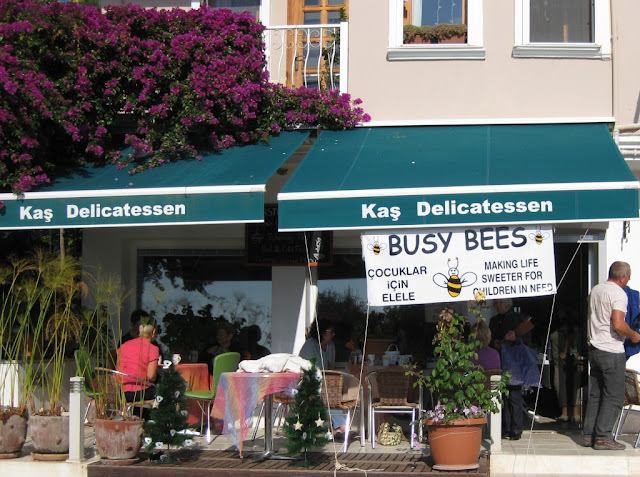 Amongst the many Bees in the community, the three “Godmothers” devote much of their time to buzzing around Kaş looking for benefactors and volunteers. Gwen was one of the founders from 2005. She is the only remaining founder member as the others have either gone back to their home country or moved on to other things and no longer have the spare time. Val joined a year later in 2006. She is the secretary and keeps the minutes of all their meetings. Sandy, a more recent member, has “lots of charity and business experience.” The BusyBees base committee is comprised of seven members (three are English and four are Turkish). Engin is a new Turkish member who speaks fluent English. Dr. Munise, the “patron” of the group, also speaks English and is the “consigliere” who is helping them wade through the Turkish bureaucracy on their way to becoming a legitimate charitable organisation for tax and legal purposes. Their meetings are always open and official and there is always someone taking minutes of the meetings. The Bees have many volunteer helpers, including several Turkish Bees, without whom, according to the Godmothers, “we could not do half the things we do.” These volunteers, Turkish and foreigner alike, are the heart of the Bees and make fund raising not only fun but successful through their efforts of assistance, purchases and hosting of garden parties. The original BusyBees-Kaş4Kids volunteers decided they wanted to “put something back into the community” into which they had settled. They also say, “it keeps them active, they meet new friends and combat boredom.” The Bees have been very gratified by the outpouring of genuine thanks from their beneficiaries. For example, a university student, whom they support with lodging, makes an effort to come see and thank them every time he is in Kaş. The ladies of BusyBees like “making things” and especially things for children. They initially took new born baby clothes to health clinics and continue this practice. They also regularly donate disposable nappies whenever they can get them. People heard about their efforts and started to donate things. The Bees then decided to sell some of the donated items to those who needed and could afford them. They then used the money to purchase items for those who could not afford. They have many things for sale that are of good, decent quality but are sold very inexpensively. The Bees store many of their items in a house in Gökseki near Kaş which a benefactor loaned to them. They give all the unsold items of clothing to really poor families through the local Imams and Muhtars, and recently sent many boxes to Van. The Bees try to keep their giving to villages and communities within 50 kilometres of Kaş. All requests for aid are thoroughly investigated first as to genuine need. They are very careful when helping a child so that the beneficiary has dignity in receiving the donations. They always go with a doctor, a teacher or some other local person who has recommended the beneficiary so as to be sensitive to the feelings of the receiving family. Donations are to help children up to 18 years of age. The Bees say it is especially difficult to get baby items and good quality second hand clothes, especially for babies up through teenage years. The Bees are not shy about asking their Turkish and expat friends to bring these items with them when they travel abroad, especially to and from the UK or the US. Teachers, doctors and other local officials recommend children and their families for giving. The BusyBees are paying for housing for a university student so he can afford to go to school (although this is an exceptional and not ordinary donation). Other things they have donated include children’s school uniforms, books, shoes and regular school supplies. They have helped patients make health payments to the local hospital and clinics and donated board games to children in Kasaba. They purchased and installed an air conditioner for two young girls who have a very debilitating skin condition called Epidemolysis Bullosa. Without the year round climate control, these girls would suffer greatly. They have donated a hearing aid to a child who was going to school and could not hear. The child’s learning was, of course, nearly zero until the hearing aid was installed and she is now making good progress. The Bees have donated walking aids and a laptop to a young girl with cerebral palsy, a child who is otherwise wheelchair bound. The Bees said she is only seven years old and has already learned to speak good English. They said this little girl is very bright and told the Bees she wanted to grow up to be a children’s doctor! They have given items to the Kaş baby clinic which include digital maternity scales and thermometers and a Doppler device to test the hearing of babies. One of their largest donations was a hospital heart and respiratory monitor which could be used for both children and adults. That monitor cost over 10,000 TL! Sometimes they find a needy child by accident. On one occasion, the Bees took a mother with her several children to a shop in town to help them purchase some clothing. One of the Bees noticed that one of the children had a significant attention deficit problem and was literally running wild. After they investigated they found out the child had a mild form of epilepsy and was on a medication that he had long outgrown from a prescription he had been given from infancy. The BusyBees arranged for a referral to a specialist to see the child and the problem is now under control with the proper up-to-date medication. For example, the Bees are currently raising funds to buy toys for the New Kindergartens (Ana Okuları) in surrounding villages. The first of these was on November 28, 2011, in Çukurbağ Village. The remaining schools are in Karadağ, Dirgenler, Sarıbelen, Islamlar, Uzumlar, Çayköy, Yuvacik, and they have been told there will be another one in a few months time in Gökseki. These nine schools consist of about 14 classes of children or roughly 260 children altogether! They have several events throughout the year to raise funds. They are always surprised by the income they derive from selling good quality second hand clothing, household items and locally baked food and desserts. They also receive donations from benefactors who either purchase a needed item locally or bring it back from their country of origin. In 2007 they put on a play, written by Ken Wilkinson, in the Antique Theatre which they said was a lot of fun as well as a successful fund raiser. Even though the BusyBees-Kaş4Kids are working hard, it seems they never have quite enough to meet the requests for aid that continuously arrive at their doors. Please, please help these dedicated and hard working Bees. They can take almost anything usable that you are willing to give and that includes well-worn Turkish Lira paper money! Small baby clothes are always in demand and in equally short supply. If you occasionally go abroad, please consider purchasing some infant or toddler clothes and bring them with you upon your return. The next time you are in one of the local markets or if you visit a large, neighbouring city, think about the children who are helped by the Bees. Be generous, your help will be greatly appreciated. BusyBees-Kaş4Kids Fund Raising and School Opening Events help in the support of local Kaş and surrounding villages’ “children in need.” Some village children would go without new schoolbooks, new shoes, toys, or uniforms without your help. BusyBees-Kaş4Kids help in a number of other ways when requests are made by local doctors, school teachers, Imans, Muhtars and other officials and village members. Please get on their emailing list to receive their newletter. This is so when you generously give to the BusyBees-Kaş4Kids, you can see where your money is spent.